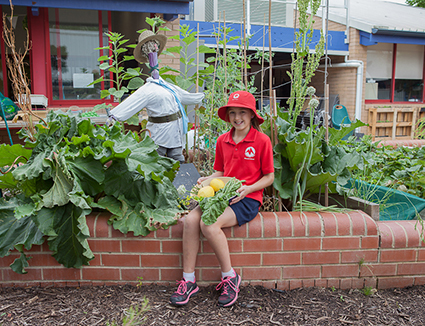 At Monash School, our Kitchen Garden program teaches students from Kindergarten to Year Six about the benefits of maintaining a healthy lifestyle through growing and caring for crops and learning to prepare healthy meals in the kitchen. Our program is a part of the Fresh Tastes initiative and has a strong focus around the Food&Me nutrition program, as well as, the Stephanie Alexander Kitchen Garden program. Outside in the garden, the lessons focus around Science and Health outcomes as students investigate different aspects of the environment. Students learn to grow and care for food crops to use back inside the kitchen. In the kitchen, students learn how to prepare and cook healthy and delicious food, while achieving Literacy outcomes through reading and writing recipes. All recipes are shared in the school newsletter, while parents/carers are kept up to date with what the children are cooking and growing each week.